As we are getting used to a sedentary lifestyle, exercise cycles can be a good option for a decent workout. Also, since the weather in India can be extreme and harsh, a good exercise cycle at home can make it easy to keep ourselves fit. Exercise cycles or riding a stationary bicycle is highly beneficial to cardiovascular health. Regularly performing cardio exercises helps in lowering high blood pressure, regulating blood sugar, and preventing heart attacks, most especially for those who already have a history. Riding a stationary exercise cycle/bike regularly promotes a more efficient heart muscle for proper blood pumping or circulation. It increases the levels of good cholesterol and decreases bad cholesterol levels that result in less plaque in the arteries. Just using an exercise cycle for 30 minutes a day for at least 5 times a week with a proper diet can help you actively manage a fit and healthy lifestyle. Exercise cycles are joint friendly, perfect for aerobic activity, without undue stress on the joints. Exercises cycles are good for reducing mechanical stress on the knees, hips, back, and ankles. In case you’re in a hurry, here are my top three recommendations for the best exercise cycles. Still confused about which exercise cycles is best for you? 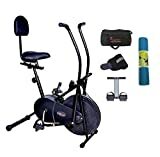 Let me help by providing detailed reviews on the best exercise cycles that I found in the market (and the ones you can buy online). These reviews will definitely help you gain awareness and understanding of the best features, pros, and cons of each exercise cycle. Below is the table that shows all the exercise cycles covered in this review. Now let’s have a look at the detailed reviews of each of the exercise cycle covered in this article. The Powermax Fitness Model BX-110SX has a backrest for ultimate body support. You can turn your room into a personal home gym using this foldable bike, offering all the essential features of an invigorating cardio exercise equipment. It is equipped with a padded seat of high-density foam with height adjustment for customization. For maximum comfort, the Powermax BX-110SX provides adequate padded back support. You can easily track your progress with the computer display so you can achieve your fitness goals. It is equipped with adjustable foot straps on counterweighted pedals for the safest workout possible. It also has a continuous resistance that is adjustable for a more powerful training session. Just simply fold the exercise cycle once you are finished. The frame has an innovative design and you can always use the handle located below the seat to store and transport conveniently in any location. The weight of the flywheel system is 4 kilograms with 8 levels of training intensity. The maximum user weight is 110 kilograms. It is equipped with a magnetic brake system, drive system, display, and transport roller. 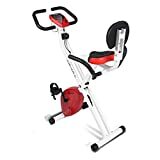 The Powermax Fitness BU-205 machine is perfect for users who are looking forward to burning calories as well as increase their stamina and cardiovascular strength at home. 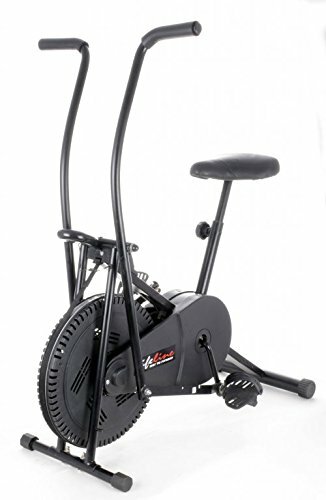 For strength adjustment, this exercise cycle features a reliable manual tension knob. It has a display monitor to show distance, time, speed, and calories burned for monitoring workout. It has extra heavy frame construction with a supportive and comfortable saddle. The handle and seat are easy to adjust to meet your preference or exercise requirements. 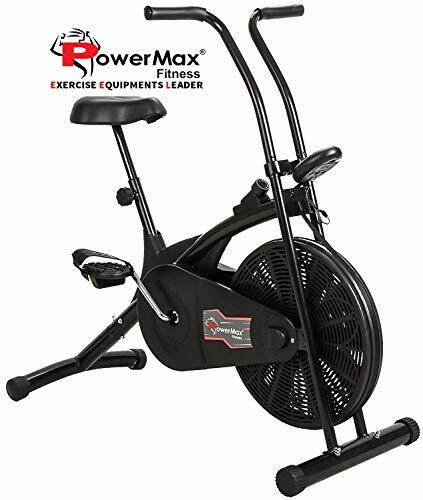 The Powermax Fitness BU-205 has been designed to ensure a quiet and smooth cardiovascular workout, which is perfect for professionals and amateurs. It is non-motorized and portable for home use, and the handles move forward and backward whenever you pedal the exercise cycle. The maximum user weight is 100 kilograms. It has a heavy-duty frame and adjustable resistance levels varied workout intensities. The Cockatoo Exercise Bike has a fixed handle type. You can easily adjust the knob by turning it. With the digital display, you can monitor your distance, speed, time, and your calories burned. It is suitable both for first-timers and professionals. It does not make noise and the materials used in manufacturing this product are heavy-duty and durable. 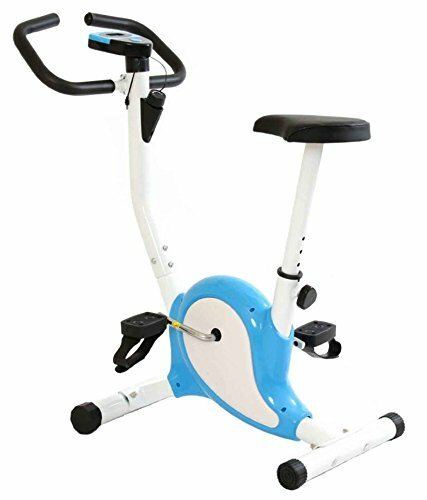 Now, you can enjoy riding in an exercise bike without stress and complaint because of the best features of Cockatoo Exercise Bike. The Healthex Exercise Bike is a body gym exercise equipment that is portable and non-motorized for home use. The electronic meter shows time, calories burned, distance, scan, and speed. It has a manual tension knob for reliable strength adjustment. The ergonomic arms come with padded grips with adjustable-reach. This exercise cycle has a steel frame construction. The seat is easy to adjust and so as the handle position. 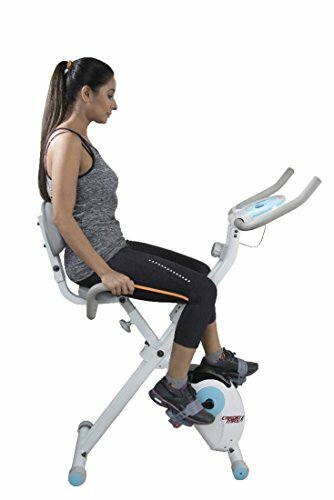 The Healthex Exercise Bike promotes improved joint mobility to improve the range of motion of the joints of the ankles, knees, and hip joints that are affected by cycling. Whenever you paddle, all the joints rotate, perfect for a range of motion. This is easy to assemble using the manual included in the package. Exercise at least 30 minutes a day for at least 5 times a week to gain cardiovascular health benefits. Now, you can engage in everyday exercise with less risk of injury. The Jsb Cardio Max hf78 comes with a 4 kilograms flywheel and 3 cranks for a smoother cycling experience. It has a unique folding design that makes a portable and compact nature used for fat reduction, slimming cardio training, and general exercise. This exercise bike comes with 16 levels tension controller and non-skid foot pedals with reliable and adjustable footrest straps. The installation video is available with the package for your convenience. It comes with a one- year warranty. You can monitor your progress with the display monitor to show total distance, speed, time, and other relevant information pertaining to your workout. It also has an easily foldable design with a maximum weight capacity of 100 kilograms. The back handles and back support are intended for your comfort and convenience measuring 103 x 53 x 119 centimeters. 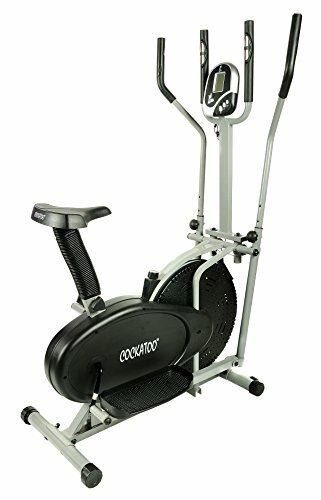 The Cockatoo OB-02 Exercise Bike has a 5 function display that shows the time, speed, calories, and distance as well as hand pulse and scan. The exercises you can perform with this fitness equipment include bike, step, run, pedal, and rowing exercises. The cycling movement exercises your lower body and the rowing movement firms your shoulders, upper arms, and abdominal muscles. The other features include an adjustable seat and 4 handles that come with a computer display. This fitness equipment comes with a belt resistance with a natural elliptical motion. It is helpful in firming your thighs and hips for a well-toned shape. 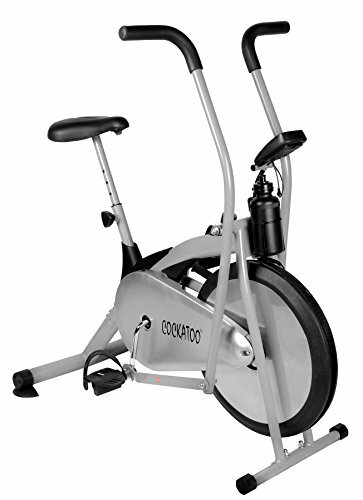 Enjoy the health benefits of Cockatoo OB-02 Exercise Bike stress-free and hassle-free. This Lifeline Exercise Bike is portable and a non-motorized exercise bike for home use. The electronic meter shows the time, calories burned, distance, scan, and speed. It has a manual tension knob that promotes a stronger adjustment. It has a padded grip with ergonomic adjustable-reach arms. It has a steel frame with an adjustable seat. The Lifeline Air Bike has been designed and developed with dual action to tone your arms and legs. You can use it for a full cardiovascular workout. It also has a micro-tension knob that is adjustable for strength adjustment. The electronic meter shows speed, pulse, distance, time, calorie, and scan. This fitness equipment has an ergonomic and adjustable padded reach arms and grips. It is made of steel frame with a maximum user weight capacity of 100 kilograms. Now, you can improve your fitness and health, most especially your cardiovascular status with Onlineworld Fitness Exercise Home Cycle. It helps to increase strength and endurance as well as burn fat. 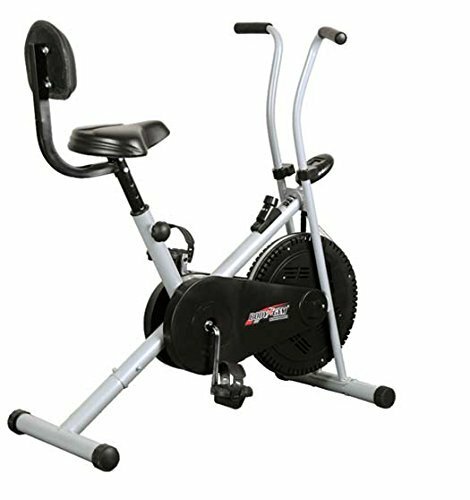 This exercise cycle has a durable steel frame and the belt drive promotes smooth pedaling. The resistance and adjustable seat make a great fit for different body types. You can track your calories burned, time, and distance with the LCD display panel that is easy to read. It is time to give yourself the ideal body you always wanted by taking time using this exercise bike. The maximum user weight is 100 kilograms with foam padded handlebars and adjustable height saddle. The pedals have adjustable foot straps with a belt system. It is silent and smooth in motion, ideal for home use. It has a robust and sturdy design for greater stability and longevity. The Lifeline Exercise Cycle is portable and non-motorized ideal for home use. It has a reliable electronic meter that displays distance, time, speed, calories burned, and scan. By using this exercise cycle, you can improve the range of motion of your knees, ankle joints, and hip joints. Whenever you paddle, your joints rotate for a better range of motion. You can now have a better health management. Only 30 minutes a day can help you shed some calories. You can burn more calories easier, allowing you to manage your weight. With regular physical exercise, it helps you in managing your weight, boosting your immune system, and reducing your risk of chronic diseases such as atherosclerosis. When paddling, all your joints rotate which is good for a range of motion. Exercise cycles have been existing on the market for many years and they represent a reliable and accessible alternative to fitness gym equipment with a hassle-free way to get rid of pesky extra pounds. There are many brands of exercise cycle suitable for home use. The best features include programming options, configurable workout resistance, and detailed computerized features. What are the features you need to consider when shopping for an exercise cycle? Most exercise cycles include comfortable, natural, and comfortable pedaling motion without jarring your joints whenever you stop pedaling. Exercise bikes eliminate the load off of your knees and back, thus giving you a no-impact exercise within the comfort of your own home, delivering an ideal workout if you are recovering from an injury or if you’re looking for a safer form of cross training. You’ll find exercise cycles with step-through frames and low seat heights, making it easy to begin and complete your workouts. You can bring in the workout intensity you need, simulating a local road race or a triathlon with an exercise cycle, providing an option of working out in a standing or “off the seat” position for your cardiovascular health. Choose indoor cycle and upright bikes that can provide the road bike fell, creating a natural fit for an outdoor cyclist who is looking for a better indoor alternative. Many exercise bikes also feature an adjustable toe strap or a pedal cage for a responsive footing while you’re exercising. There are certain models allowing you to simply swap the pedals, and for a customized workout with standard outdoor bike pedals. Find an exercise cycle with a larger and softer seat. Now you can enjoy your ride using an indoor exercise cycle without discomfort. A good exercise cycle should be durable with a high-quality frame. It has a balanced flywheel to spin more effectively and efficiently. The flywheel spinning separately from the pedals allows you to stop similar to an outdoor bike, reducing friction on your knees. 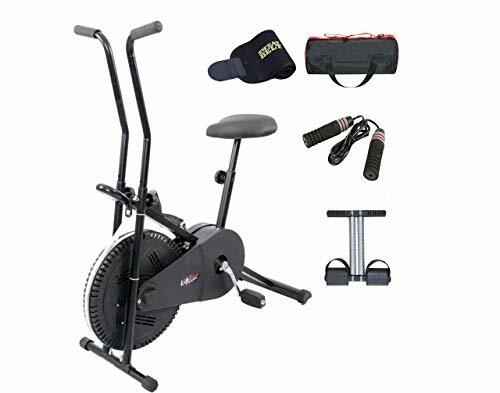 For a powerful and quiet resistance, it is helpful choosing a magnetic brake bike, so you can workout hard while hearing your favorite movie and TV show. It is important to find an exercise bike with different resistance levels and a comfortable seat because you’ll be spending time on it. If you’re not exactly an average-sized, find an exercise cycle with an adjustable seat. You can buy extra seat cover with padding or gel. Your comfort should be your priority no matter how much your budget is. Pedals should not only be wide enough, but they also need to have straps to ensure safe and comfortable feet without slipping when you’re pedaling. With a built-in computer, it allows you to monitor your workout stats such as time, speed, and your calories burned. If you need to monitor your heart rate, find an exercise bike with a heart rate monitor included or you can also easily purchase a separate monitor. When buying an exercise bike, always check the weight of the equipment and the weight limit because stability is one of the most crucial aspects of exercise, and the last thing you want is causing injury yourself when you’re riding the bike. In order to determine if an exercise bike sold online is stable, check out the weight because the greater weight means a more stable unit. Also, make sure to check for the availability of transport wheels for a heavy exercise bike so you don’t have a hard time moving it from one place to another. Based on the resistance of an exercise bike, some brands are quieter as compared to others. Those bikes with fans included tending to be noisier due to air resistance feature. It means that the harder you pedal, it makes a louder the noise. In most cases, exercise cycles do not make an unbearable sound. On the other hand, if you have pets and children around, it is important to find an exercise cycle that is safe by ensuring that the mechanics such as the flywheel and chain are covered, for children not to get their fingers or any body parts get stuck in them. We have covered all the essential aspects you need to take into consideration when shopping an exercise cycle for home use. You are now more confident finding the best exercise bike for you and your loved ones, regardless if you’re a novice or regular cyclist.